The village of Boys Town was established in 1917 as the headquarters of the Boys Town organization, also known as "Father Flanagan's Boys' Home", founded by Father Edward J. Flanagan. It is dedicated to the care, treatment, and education of at-risk children. In 1943 Boys Town adopted as its image and logo a sculpture of a boy carrying a younger boy on his back, captioned "He ain't heavy, Father, he's my brother." Boys Town is located at 41°15′39″N 96°7′55″W﻿ / ﻿41.26083°N 96.13194°W﻿ / 41.26083; -96.13194 (41.260901, -96.131882). According to the United States Census Bureau, the village has a total area of 1.36 square miles (3.52 km2), of which 1.32 square miles (3.42 km2) is land and 0.04 square miles (0.10 km2) is water. As of the census of 2010, there were 745 people, 6 households, and 2 families residing in the village. The population density was 564.4 inhabitants per square mile (217.9/km2). There were 15 housing units at an average density of 11.4 per square mile (4.4/km2). The racial makeup of the village was 66.0% White, 26.2% African American, 3.5% Native American, 0.4% Asian, 0.1% Pacific Islander, 1.6% from other races, and 2.1% from two or more races. Hispanic or Latino of any race were 10.1% of the population. There were 6 households of which 16.7% had children under the age of 18 living with them, 33.3% were married couples living together, and 66.7% were non-families. 66.7% of all households were made up of individuals and 16.7% had someone living alone who was 65 years of age or older. The average household size was 3.17 and the average family size was 3.00. The median age in the village was 16.7 years. 72.8% of residents were under the age of 18; 10.9% were between the ages of 18 and 24; 13.2% were from 25 to 44; 2.8% were from 45 to 64; and 0.1% were 65 years of age or older. The gender makeup of the village was 57.2% male and 42.8% female. As of the census of 2000, there were 818 people, 57 households, and 53 families residing in the village. The population density was 589.7 people per square mile (227.2/km²). There were 58 housing units at an average density of 41.8 per square mile (16.1/km²). The racial makeup of the village was 66.01% White, 21.15% African American, 1.34% Native American, 0.49% Asian, 5.01% from other races, and 5.99% from two or more races. Hispanic or Latino of any race were 7.58% of the population. There were 57 households out of which 68.4% had children under the age of 18 living with them, 93.0% were married couples living together, and 7.0% were non-families. 7.0% of all households were made up of individuals and 5.3% had someone living alone who was 65 years of age or older. The average household size was 3.32 and the average family size was 3.47. In the village, the population was spread out with 78.9% under the age of 18, 8.9% from 18 to 24, 11.0% from 25 to 44, 0.7% from 45 to 64, and 0.5% who were 65 years of age or older. The median age was 16 years. For every 100 females, there were 219.5 males. For every 100 females age 18 and over there were 150.7 males. As of 2000 the median income for a household in the village was $51,442, and the median income for a family was $51,944. Males had a median income of $31,563 versus $21,042 for females. The per capita income for the village was $3,048. None of the families and 6.1% of the population were living below the poverty line, including none under 18 and none of those over 64. ^ "Boys Town, Douglas County". Center for Advanced Land Management Information Technologies. University of Nebraska. Retrieved 8 August 2014. ^ "Annual Estimates of the Resident Population: April 1, 2010 to July 1, 2012". Retrieved June 22, 2013. 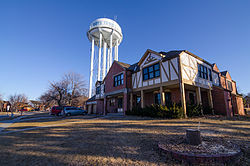 Wikimedia Commons has media related to Boys Town, Nebraska. This page was last edited on 12 January 2019, at 19:15 (UTC).